Rites of Passage Girls Camp, Inc would like to thank all our stakeholders and members of the community who have reached out to help us get camp going this year. We are encouraged by all of you that make this endeavor almost effortless. 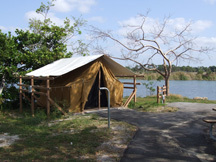 2012 summer camp was held at Quiet Waters Park campground. Your donations, volunteer efforts, suggestions, and well wishes truly inspired us and made a difference in the planning and implementation. This quarter we begin working towards fulfilling our goals and objectives for summer camp 2013. The Second Annual Rites of Passage Girls Summer Camp was held from July 14, 2012 through July 19, 2012. This year, although we did not meet our goals in recruiting participants and volunteers, we were able to have a successful program. The program was modified to five-day camping, instead of a full week. The administration continues to build instruments necessary to fulfill our main focus, which is to provide each participant a foundation to build self-esteem, develop good body image, develop effective decision-making skills. Furthermore, participants are given tools to beat depression and anxiety, build leadership skills, learn yoga, breathing and meditation and other healing techniques through conceptualized transformation workshops. The girls will network and make new friends, participate in peer mentoring, play sports and have lots of fun, in an aesthetic environment. The dedicated staff of attendants, practitioners and camp counselors will provide the program with one adult to every five girls participating for monitoring purpose. A big thank you to Broward Children Services Council, Broward Chamber of Nonprofit Organizations, and other organizations for providing this program with resources and assistance to build our capacity to serve effectively. Thanks to our dedicated volunteers for the team spirit, and anyone who helped us in any capacity to launch this program successfully in South Florida. Thanks to Lacresha Thomas and Catrina Green-Shearer for assisting and participating in the 2nd annual summer camp program. Planning for the 2013 summer camp is in progress, and we are once more reaching out to the grassroots community and nonprofit organizations for any assistance we may need. We are also recruiting volunteers for the program. We have started our fundraising for this year by implementing our Holistic Resource Center, for dissemination of holistic information including alternative healing, yoga, gifts ,inspirational and motivational books, dvds and cds, and skincare, personal care, vitamin and herbal supplements, and much, more. Summer camp t-shirts, caps, and other accessories are on sale along in our product store. We are setting up kiosk at designated locations throughout our target community to raise funds and recruit participants. We are also raffling another 50-60" flatscreen television, and conducting a Parklane Jewelry fundraising campaign. Contact us for tickets. (This is closed to staff members or their families). We would appreciate your donation. All participants are expected to participate in fundraising events. Once again, we want to tell you how grateful we are for your support, without which this summer camp would not exist. We thank you. Rites of Passage Girls Camp, Inc.